It was the year of sneakers in 2018. 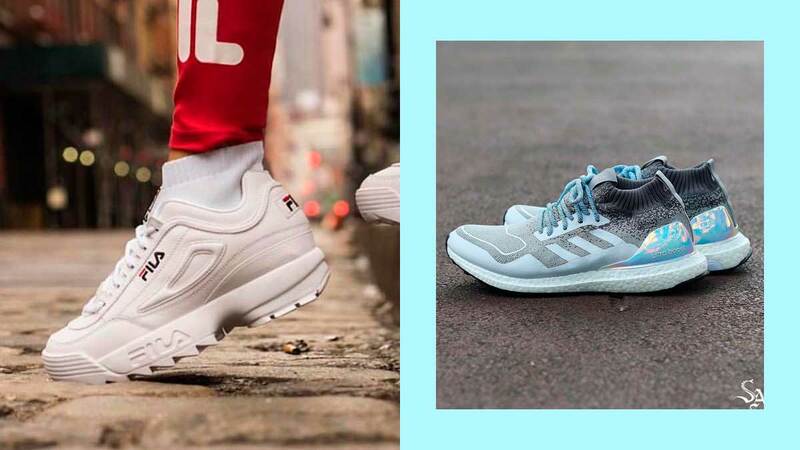 With the rise of athleisure, we saw the fashion scene's loving acceptance of sneakers as a stylish shoe to wear to absolutely any ocassion. With this list we've curated the prolific pairs of the year, from designer drops, celebrity collabs, and throwbacks from sneakers' past. Demna Gvasalia gave us a pair of Dad sneakers and started the whole chunky sneaker frenzy. With multiple brands churning out shoes that referenced the '80s and '90s, Gucci decided to revamp the classic minimalist sneaker with Alessandro Michele's trademark quirk. Snakes, beetles, and metallic green and red tones Guccified the classic white shoe. We all knew chunky sneakers went from fashion phase to full-blown trend when Louis Vuitton hopped on the bandwagon. But the French maison doesn't do things half-heartedly, just take a look at their futuristic Archlight sneakers that showed off the luxury house's upscale take on sporty shoes. King of collabs, Off-White's Virgil Abloh made sports shoes extra cool this year. Whether it was the quotation marks or the orange tag that drew you in, Nike's Virgil-revamped Presto was a sure ticket to this year's It crowd. Kanye West continued to work with Adidas, producing their next generation of limited-edition Yeezys in muted tones. The Yeezy 500 was the brand's latest offering of chunky sneakers, made of premium leather, mesh, and suede. Adidas' comfiest shoe, the NMDs, get a new, more colorful and vibrant iteration, all thanks to Pharrell Williams. The singer took inspiration from Africa, his motherland. VaporMax is Nike's lightest innovation yet which many claims to be their choice of footwear for running and fit for all-day wearing. The Ultra Boost is not a new Adidas sneaker since it was released way back in 2015. But with its continuous update throughout the years, this pair has been proven to be a cult favorite for the comfort, responsiveness, and flexibility it offers to the wearer. Nike ruled this year's throwback shoe list, with two popular reissues that we've seen everywhere on just about anyone. But it's the Fila Disruptor II that trumped all throwback sneakers (or all sneakers, as a matter of fact). It's prized for its comfort, bang for buck, and overall silhouette and trendiness. Meghan Markle pulled out the Veja brand from obscurity and threw it on everyone's radar. But we're betting you're not buying into the brand simply because of the so-called Meghan Markle effect. As an added bonus, the brand also promises sustainable and eco-friendly sneakers.